“In the age of superheroes, Clint Eastwood’s masterpiece is all about what an honest man can achieve in the real world,” writes Rohan Kumar. The film ‘Sully’ (Clint Eastwood, 2016) is a clear reflection of the man it chooses to portray. Captain Chesley Sullenberger – commonly known as Sully – is a US Airways pilot, who quickly rises to fame after saving the lives of 155 passengers on his flight, by successfully executing an emergency landing on the river Hudson. Despite the heroic act, however, Sully’s integrity is questioned by the airline and insurance companies, who pursue their own interests. The film is then centered on this honest man’s efforts to salvage his pride. In its portrayal, the film is as unpretentious as its subject. And, in the age of superheroes, ‘Sully’ is all about what an honest man can achieve in the real world. The film begins with a nightmare that Sully experiences as real, only to wake up and realize that in spite of having saved the lives of all those people, the one life that he could not save was his very own. He expresses this feeling to his wife over the telephone, when he tells her that he wishes to go back in time to the day before it all began. ‘Sully’, the person, certainly cannot do that, but ‘Sully’ the film can. 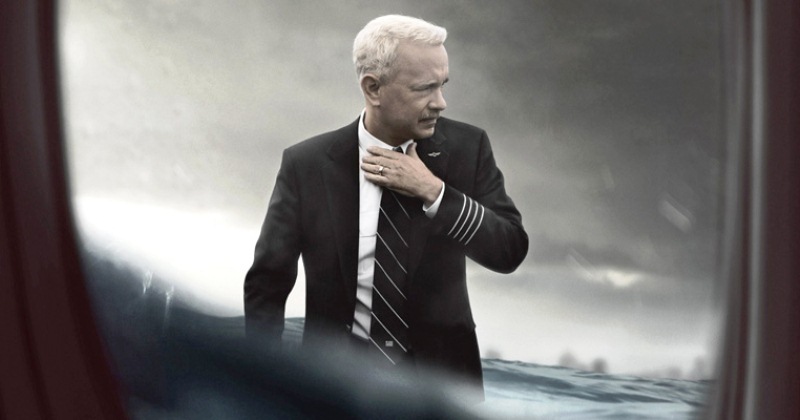 The narrative then takes a non-linear approach to uncover the events that restore Sully’s integrity. It is dictated as much by the past as it is by the future. The past, seen through Sully’s eyes of self-doubt, at times manifests itself through projections of the worst case scenarios – of how horribly wrong it could have all gone. The future, on the other hand, looks bleak as the investigators continue to cruelly persecute Sully for having done the right thing. The present is muddled in isolation, self-reflection, and despair. Sully’s communication with his family is reduced to the bare minimum, and his restlessness in the situation is made evident by the habit, that has been associated with Tom Hanks since the days of Forrest Gump, of running. The truth of Sully is inexpressible. It is what every human-being knows in the deepest recesses of their own hearts and souls, if they are willing to look at it with utmost sincerity; sincerity like the kind that Sully demonstrates. The inexpressible in the film shows itself in the contrast that the film’s climax highlights between man and machine. Although the movie poster focuses on the aircraft with its arms spread out, holding all the passengers safely on its limbs, and the magnificent images of the mammoth machine on ground and in flight are awe-inspiring in the film, it’s the primordial exhilaration that comes from mastering the beast of a machine, which has freakishly lost control of itself, that ‘Sully’ provides to the viewer. What begins with a quest for human error, ends up becoming a subtle reminder of man’s innate potential for ingenuity. With wit and industry, Sully is not only able to tame the machine, but also an equally dead and unfeeling system of society. Rohan is your average super-human, who discovered a passion for writing when it set him free from the bonds of mortality. During the day, he uses his language skills to help e-learning and at night he embarks on an eternal odyssey in book-sized spaceships.